Twenty two students from various Chinese Independent high schools received scholarships to pursue their education at Sunway University and Sunway College at the Sunway Chinese Independent School Extra-Curricular Activity (CIS ECA) award ceremony. This is Sunway Education Group’s fourth year in providing scholarships to exemplary Chinese Independent School (CIS) students who have proven to be well-rounded in both academic and extra-curricular activities. Sunway CIS ECA Scholarship recipients and the heads of department for the programmes of Sunway University and Sunway College with Elizabeth Lee (front row, centre), Professor Graeme Wilkinson (second from right) and Professor Pua Eng Chong (far right). 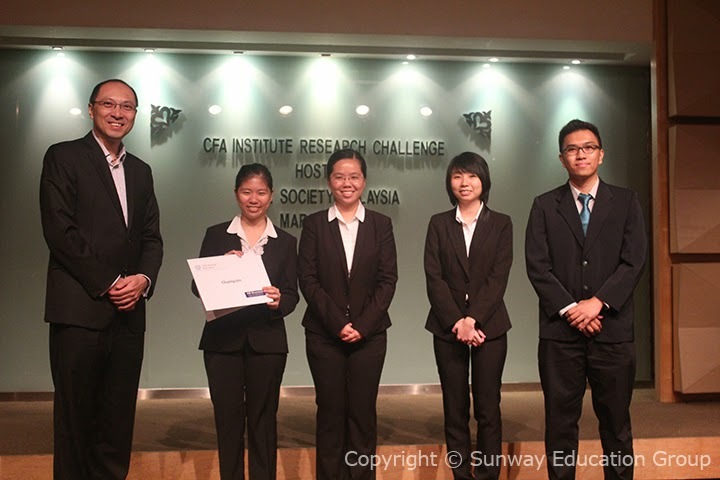 Sunway’s team emerged champion at the Chartered Financial Analyst (CFA) Institute Research Local Final Challenge 2014, beating teams from two other Malaysian universities. The competition was hosted by CFA society Malaysia. The CFA Institute Research Challenge is an annual global competition that provides university students with hands-on mentoring and intensive financial analysis training. Students assume roles of research analysts and are tested on their ability to value stock, write initiation of coverage report and present recommendations. Sunway’s team comprised of four: Ang Hui Mei, Ng Jia Wen, Ong Yue Wen and Wilson Chiong Zhan Hua, 21 year old students of Sunway TES Centre for Accountancy Excellence, currently pursuing Association of Chartered Certified Accountants (ACCA) programme. Winning the challenge proved they demonstrated a high caliber of business intellect and financial knowledge. The team was required to conduct a research report at the initial qualifying stage and a presentation at the finals on their chosen organisation. “It was fun!” chorused Ambrose, Beatrice, Calvin, Sze Yuan and Shin Loong, A-level Science students who became friends at Sunway College’s pre-university programmes orientation. The campus was filled with laughter and new faces as a new cohort of students joined Sunway College. Students of the 5 pre-university programmes, CIMP (Canadian International Matriculation Programme), Foundation in Arts (FIA), MUFY (Monash University Foundation Year), A-Level and Australian Matriculation Programme (AUSMAT), started off their college experience with orientation. “Today is a new chapter. Joining pre-U, you are moving closer to pursuing a university degree, to your career and other things in life. I wish you the very best for your future, do well, succeed and move on. I hope to see you again at your graduation,” said Elizabeth Lee, Senior Executive Director of Sunway Education Group in her warm welcome to the students.